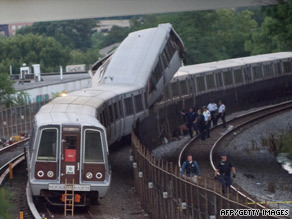 In update, NTSB says that after repair, circuit periodically lost "ability to detect trains"
WASHINGTON (CNN) -- Officials investigating last week's crash of two Metro subway trains said a system used to detect trains in the area of the accident had failed intermittently in the days immediately before the fatal crash. Investigators are shown at the crash scene in Washington. Nine people were killed in the June 22 accident. Officials earlier reported that the track circuit had been repaired June 17, five days before the crash. In an update Wednesday, the National Transportation Safety Board added that after the repair, the circuit "periodically lost its ability to detect trains." The NTSB says the Washington Metropolitan Area Transit Authority reported the problem during a post-accident review of track circuit data, but it was not immediately clear if operators were aware of the problem before the accident. A call to the transit authority was not immediately returned. In a prepared statement, Metro General Manager John Catoe said the track circuit data problem "... is not an issue that would have been easily detectable to controllers in our operations center." He said Metro is working with the NTSB to find the "root cause" of the accident, and said he wanted to assure metro riders that the system "is as safe as it can be." Nine people were killed in the June 22 accident. According to the NTSB, which is investigating the crash, maintenance records show that an "impedance bond" for the track circuit where the accident occurred was replaced June 17. The NTSB says it is now reviewing documentation on the performance of the track circuit both before and after the June 17 repair. Since the accident, the transit authority has stopped using a computer system designed to avoid collisions and is operating the trains manually, leading to delays. The NTSB, meanwhile, has been conducting nightly tests at the accident scene between the Fort Totten and Takoma stations. On the weekend of July 18, investigators intend to conduct tests to determine when the stopped train would have been visible from the train that struck it. The previously reported rail-streak marks consistent with heavy braking were approximately 125 feet long, and began approximately 425 feet before impact.